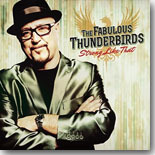 Veteran band The Fabulous Thunderbirds are back with another stellar album, Strong Like That, this time on Severn Records. It's this month's Pick Hit. This month's Surprise pick comes from someone who certainly is a surprise, as I had never heard of Si Cranstoun before. His Old School disc is a keeper! An album by the late bluesman Michael Burks, I'm a Bluesman, resurfaces and is available once again. It's our Flashback feature this month. Our What's New section features reviews of new CDs from Sugar Ray and the Bluetones, Lurrie Bell, Duke Robillard, Ronnie Earl, JJ Thames, Vaneese Thomas, Doug MacLeod, Johnny Nicholas, Smoky Greenwell, The King Brothers, Dan Bubien, Bruce Katz, Kat Riggins, Grady Champion, The Ally Venable Band, and many, many more.